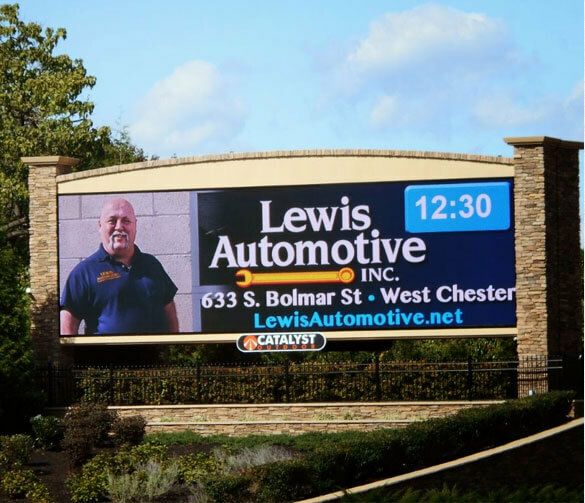 Proposed digital billboard and demolition of R. Brognard Okie building – Tredyffrin Township, is this progress? The Trust’s 14th Annual Historic House Tour this past Saturday was a huge success, raising over $30,000 for historic preservation and the completion of the Jones Log Barn as the Living History Center at Duportail. We are grateful to the wonderful historic homeowners for opening their beautiful historic homes to the public … and for the generous individuals and company sponsors who make this annual event possible. (Click here for list of sponsors). We thank the sponsors and homeowners for prioritizing the importance of our local history and its preservation. And to the many volunteers and Trust Board members, I say thank you – including sixteen student docents from Conestoga High School who gave up their Saturday afternoon to help! With the annual historic house tour in the rear view window, I turned on the township’s Board of Supervisors meeting last night to watch a presentation by Catalyst Outdoor Advertising. Catalyst is proposing the installation of a monument billboard in Paoli to ‘welcome’ people to the township. This proposed large electronic sign (similar to the digital billboard on Rt. 202 in East Goshen) is planned for the corner of the busy intersection at Lancaster Avenue and Rt. 252. I am not a fan of billboards in general and yes, there is currently a small traditional billboard on that corner by the Septa train overpass. Although the Catalyst presentation was wrapped in landscaping plans for the corner, featuring seasonal plantings and offers to provide free advertising for township announcements, events, etc., there is major revenue for Catalyst in these image-shuffling, highly lucrative digital billboards — bringing in many times over the income of traditional billboards. When the Catalyst presenter named the types of digital advertisers, car dealers topped the list; making the support from a Del Chevrolet representative in the audience no surprise (the dealership is walking distance of this proposed billboard!) By design, these large 20 ft. high digital signs are intended to be attention getting. Our lives are becoming increasingly digitized – these digital screens are popping up everywhere. Have you ever tried not to watch a flat screen TV mounted in a restaurant or public waiting area? There was not a large audience at the supervisors meeting and a few people, maybe three or four spoke in support of the digital sign (including the Del Chevrolet representative). However, one resident brought up exactly what I was thinking as I watched the presentation – safety concerns with the proposed digital sign at one of the busiest intersections in the township! Although safety concerns were quickly dismissed by the Catalyst representative as not a problem, there are many available accident studies about driver distraction as a result of digital billboards that would counter his position. These digital billboards are extremely bright and are designed to be visible in bright sunlight. With images rotating every few seconds, this type of signage is designed to be eye-catching (read distracting), and they are. Perhaps an argument could be made for these “televisions on sticks” on long stretches of highways but please don’t try to sell the residents that Tredyffrin Township needs one as a ‘welcome’ monument to our community – in my opinion, a huge TV screen that plays moving ads by the side of the road does not represent our historic 300-year old township. Aside from my strong aversion to these large computer generated billboards, I have saved the best for last. To accommodate the installation of this large 20 ft. high billboard, Catalyst will need to demolish the historic Clockworks building that is located on the proposed site. The Clockworks building was chosen as worthy of protection and was included in Tredyffrin Township’s 2003 Historic Resource Survey. The building dates to 1900 and is built in the Colonial Revival architectural style. Although it is not an 18th century toll house, it was built to replicate a toll house which was originally located on the site. The best part of the story is that the building’s design was by none other than famous American architect R. Brognard Okie. The Clockworks building is a complete Okie house (versus an Okie restoration or addition) and is a prized building by many and meaningful in the architectural development of the township. Three years ago, many helped fight the battle to save the Covered Wagon Inn, the ‘welcome to the township’ building located on the corner of Old Eagle School and Lancaster Avenue. 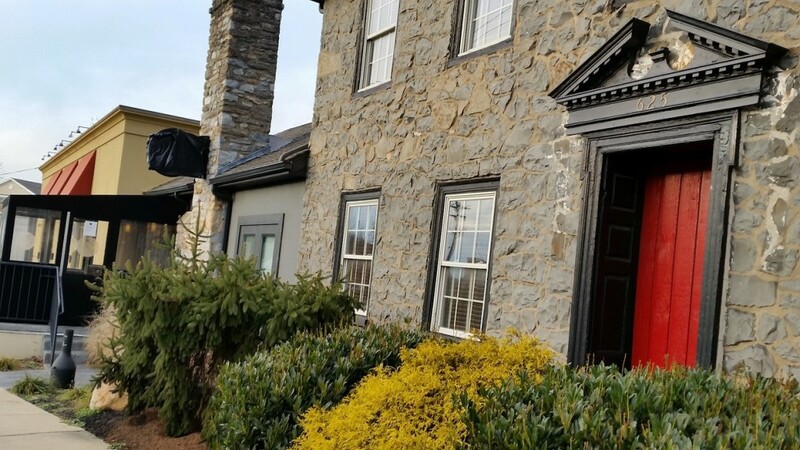 If you now travel west on Route 30, you enter Tredyffrin Township greeted with the beautifully restored 250-year old inn – representative of our local history. Don’t get me wrong, I’m all for progress and thoughtful development but do we really need or want digital billboards in our 300-year old township? Remember, there are two other traditional billboards, one on Rt. 252/Bear Hill Road and another on Lancaster Avenue across from the BMW dealership — are they next for digital billboard advertising? House Tour, Hurricane Matthew, Fritz Lumber & T/E School District Finances! Community Matters readers — I haven’t disappeared; it’s been a busy last month. First there was the Trust’s 12th Annual Historic House Tour on Sept. 24 which I am delighted to report as extremely successful. To the house tour guests and to the sponsors who support historic preservation and make the annual tour possible, we say thank you. And a special thank you to the historic homeowners for opening their homes to the public – the historic homes really are the stars on house tour day! Following the house tour, my husband and I went to our 100-yr. old house on Port Royal Island, SC for a few days. On the intercostal waterways, the Sea Islands are located between Charlestown, SC and Savannah, GA, close to Beaufort, SC and Hilton Head. We stayed on the island until Hurricane Matthew forced our evacuation and then spent the next 4 days wondering if our house survived. Although the area endured major destruction and many folks suffered great loss, I am happy to report that our house remained standing. We did suffer some roof damage and are now maneuvering through the insurance process. After returning from SC, my focus shifted to ‘Puttin’ on the Ritz … A Party in the Yard’ – a celebration of the Fritz family and the 153 years of the William H. Fritz Lumber Company in Berwyn on Saturday, Oct. 22, 7-11 PM. The property’s new owner Eadeh Enterprises is the presenting sponsor for the event — Company president Stacey Ballard has enthusiastically supported the event and the celebration of the Fritz family. On behalf of the Tredyffrin Historic Preservation Trust, we are excited to honor the contributions of the Fritz family to the community. Guests will enjoy great food, live music and live & silent auctions plus the opportunity to walk the property for one last time. It really will be an evening to remember, tickets are available at www.tredyffrinhistory.org . Here’s another historic preservation update — John Zaharchuk, owner of Summit Realty Advisors invited me to a meeting a few weeks ago with himself and Heckendorn Shiles Architects. Summit Realty is the developer for the CVS project at the Covered Wagon Inn site in Strafford. With restoration plans and drawings now in place, it was a privilege to see the PowerPoint presentation for the Covered Wagon Inn along with samples of proposed materials. In a word – WOW. I was truly impressed at their enthusiasm and with the level of preservation detail planned for the 18th century inn. Yes, we will have a CVS pharmacy on the property but the Main Line landmark is saved (and restored!) in the process! Thank you John Zaharchuk and Heckendorn Shiles! Supervisor and school district meetings continue and I appreciate the diligence of my friend Ray Clarke to attend, especially given my absence of late. Substitute teacher daily rates. TE is at the low end of the rates paid by our regional peers, and the fill rates for vacancies are down in the 80% decile from last year’s 90%. This is a nationwide issue and reflective of lower teacher graduation numbers. The Committee agreed to the Administration request to match the rate paid by Lower Merion (not the best comparison? ), which would make our starting rate of $115/day higher than 10 of the 13 peers benchmarked. Bond advance refunding. Lots of technical issues here, but a notable bottom line: the Committee is recommending that the Board approve next Monday the parameters of a bond issuance, even though our long-time bond counsel, Saul Ewing, disagrees with the investment banker (not the district’s Fiduciary) about the IRS rules, the structuring of the issue and, as a consequence, the savings. Between now and Monday the District is going to shop for a counsel to give a more favorable opinion to approve 10 year debt service savings of at least $500,000 and hopefully over $1 million. c) that current residents should pay anything while the General Fund Balance contains $32 million of current taxpayer money, including $5 million already committed for capital projects and over $9 million for PSERS (for which the district can and does tax every year). There are really important issues in all of this, and I hope that residents can find some time assess the pros and cons and let the Board know their opinion. It’s Official — Covered Wagon Inn is saved! Local history will coexist with CVS Pharmacy – thank you Summit Realty Advisors! At last night’s Planning Commission meeting in Tredyffrin, the proposed land development project to construct a new CVS pharmacy building with drive-thru on the corner of Old Eagle School Rd. and Lancaster Ave in Strafford was back in front of the planning commissioners. Much has happened since the developer of the project, Summit Realty Advisors, first presented their redevelopment plans for the property in January which included the demolition of the Covered Wagon Inn. As I have said from the start, the property owner John Hoopes and the developer for CVS Pharmacy, Summit Realty Advsiors and owner John Zaharchuk, were within their legal rights to demolish the Covered Wagon Inn as originally planned. There is no current historic preservation ordinance in Tredyffrin Township that protects the community’s historic buildings — not even those that are registered as National Historic Register properties! To change the redevelopment plans for CVS Pharmacy project to include saving the Covered Wagon Inn was time-consuming and expensive for the developer — John Zaharchuk met the challenge and was successful! It is important to acknowledge and thank those involved for saving the Covered Wagon Inn which I did publicly last night on behalf of myself and Tredyffrin Historic Preservation Trust. We know that redesigning a significant redevelopment plan to save a 250 year old inn was not easy (and was not legally required) — yet you did and we thank you! Plans to build a CVS pharmacy in Strafford, revised last month to preserve a historic Main Line landmark on the property, moved forward Thursday when Tredyffrin Township officials approved the new preliminary proposal. The plans that Ambler-based developer Summit Realty Advisors submitted to the township on April 22 call for a 12,900-square-foot store with a drive-through and a stone facade. The proposed project no longer includes the demolition of the Old Covered Wagon Inn, an 18th-century fieldstone structure at Lancaster Avenue and Old Eagle School Road. The inn, which measures about 800 square feet, would remain on the corner of the property with the CVS beside it, according to Summit’s latest application. The six members of the township Planning Commission who were present voted unanimously to approve the preliminary land development plans. The developer still must meet several requirements, including measures to control storm water runoff, streetscape improvements, and a written promise that the inn would be preserved. The developer will restore the exterior of the inn and provide four parking spaces for any potential tenant that moves into the building, said Lou Colagreco, a lawyer for Summit. Summit first brought the project before the commission in January. But after residents learned that the developer planned to raze the inn, citizens and preservationists rallied to save the building, where Duke Ellington and other famous musicians performed, where residents attended wedding receptions and got together for family meals. More than 4,300 people have signed an online petition to save the onetime tavern along the first turnpike. The developer said in February it would come up with a compromise. The company went with a plan that had worked in Lower Providence Township, Montgomery County. There, the Audubon Inn, built in the 1750s, was included in the development plans for a CVS and kept on the corner of the property. The Audubon Inn houses law offices. Plans for the CVS in Strafford still include the demolition of an addition put on the Covered Wagon about 50 years ago that housed several restaurants through the years and provided space for the Thos. 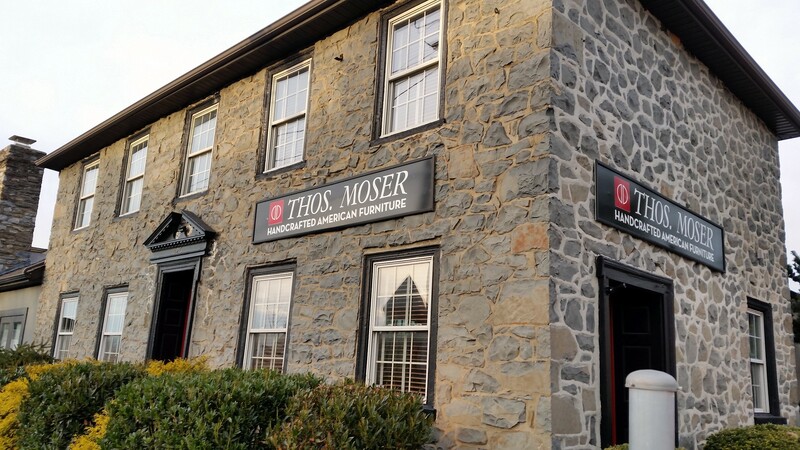 Moser furniture store, the most recent tenant of the Covered Wagon building. Residents focused on saving the historic building. Pattye Benson, president of the nonprofit Tredyffrin Historic Preservation Trust and leader of the campaign to save the inn, acknowledged that the developer and property owner would have been within their rights to demolish the historic building. “To me, this represents really good development and how you can put a new building in and still save a historic building,” she said. Exciting News: No Demolition for the Covered Wagon Inn! What’s the saying, “If there’s a will, there’s a way”. Late tonight, I learned from Tredyffrin Township supervisor Sean Moir that an agreement has been reached to save the Covered Wagon Inn from demolition. Over the last couple of months, there has been much discussion about the saving the old field-stone building located on the corner of Lancaster Avenue and Old Eagle School Road in Strafford. Meetings were held with the township staff, supervisors, planning commissioners, CVS pharmacy developer Summit Realty and owner John Zaharchuk and property owner John G. Hoopes. At one point, it was suggested that a nonprofit historic preservation organization needed to step in to save the building. 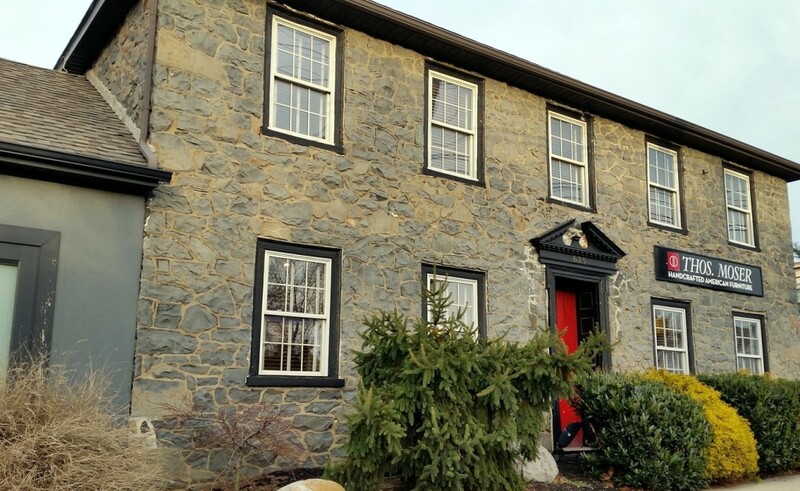 As President of Tredyffrin Historic Preservation Trust and with a unanimous vote of support from our Board of Directors, the Trust stepped in and offered our help in saving the building! But in the end, Hoopes and Summit were able to come up with an agreement. The new plan will allow the construction of the CVS pharmacy but also preserves the 18th century Covered Wagon Inn. Hoopes will retain control of the Covered Wagon Inn, handle the interior renovations and lease the space. Summit will restore the exterior of the Covered Wagon Inn as part of their CVS land development project. The saving of the old Covered Wagon Inn is a home run for historic preservation in Tredyffrin Township! I am thrilled that the Covered Wagon Inn is to be saved and that local history will coexist with CVS. Thank you John Zaharck, John Hoopes and CVS Pharmacy for listening to the community and saving an important part of our community’s history! In 1986, the Covered Wagon Inn was saved from demolition — will history repeat itself? Timing really is everything! Over the last couple of weeks, I had been working with Philadelphia Inquirer writer, Michaelle Bond on her Covered Wagon Inn article for the paper. As often happens in the newspaper world, local stories tend to get pushed back from their initial date of publication. I had just about given up on ever seeing the article, when “Can main line history coexist with a CVS” appeared on the front page of today’s Philly Inquirer and, as they say in the newspaper world, the story was “above the fold”. Michaelle did her homework on the article, reaching out to the developer, Summit Realty Advisors, Pennsylvania Historical & Museum Commission, Tredyffrin Easttown Historical Society and Tredyffrin Township staff. She also spoke with the Greg Caneda, a member of the family who owned the Covered Wagon Inn from 1959 to 1986. Since 1986, the property has been owned by John G. Hoopes of Berwyn. All parties contacted by Michaelle responded with the exception of Hoopes, who did not respond to her requests for comment. Hoopes owned Hoopes Realty, one of the Delaware Valley’s largest residential real estate firms for many years. I did a little research on Mr. Hoopes and interestingly thirty years ago, Hoopes had plans to demolish the Covered Wagon Inn. Immediately after Hoopes purchased the property on the corner of Lancaster Avenue and Old Eagle School Road from the Caneda family, he presented his redevelopment plans for a 9,000 sq. retail building to the Tredyffrin Township Planning Commission in January 1986. Hoopes’ plans called for a new retail building using a mixture of exterior materials, including stone and stucco. One of the walls was to use glass brick and the building was to be topped by a clerestory tower. Hoopes land development plan included the demolition of the Covered Wagon Inn. According to a Philadelphia Inquirer article dated January 20, 1986, ‘Building Plan Called Junk’, Hoopes proposed plan, which included the demolition of the old Covered Wagon, was called “junk” by several of the township’s planning commissioners. In explaining his desire to demolish the Covered Wagon Inn, Hoopes said, “The building there now is very unfriendly to the public.” Former Planning Commissioner Chair Oleg Dudkin responded, “What you’re seeing here is a unanimously unfriendly attitude now to what you’ve got!” He further stated, “There’s an impasse here. That corner is sensitive”. Thirty years ago, Tredyffrin Township’s Planning Commissioners stood up to Hoopes; telling him that he needed to redesign the plan so as not to demolish the Covered Wagon Inn. Although certainly dissatisfied with the planning commissioners, Hoopes balked at redesigning and did not pursue his 1986 land development plan, The Covered Wagon Inn was allowed to remain for the next thirty years. 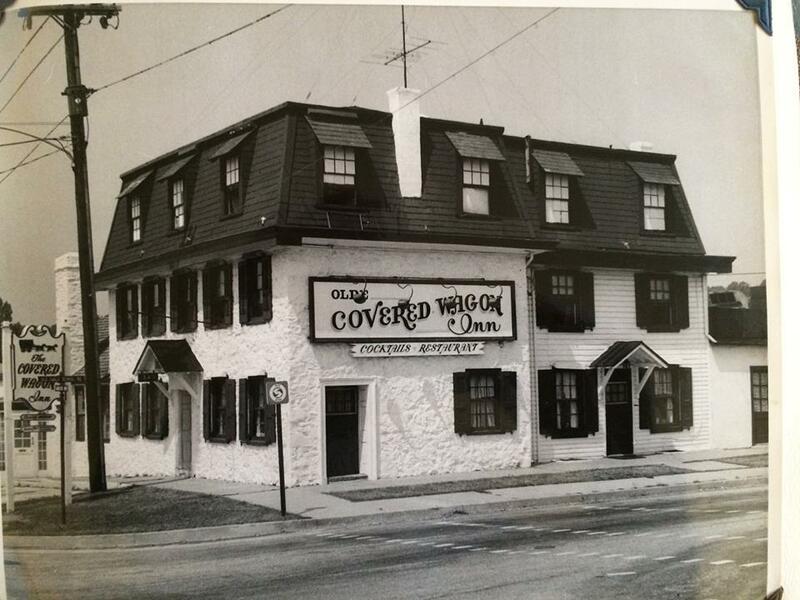 As was the case in 1986, and continues to be the case in 2016, there is no historic preservation ordinance to protect the Covered Wagon Inn or any other historic building in Tredyffrin Township. Will our 2016 Tredyffrin Township officials have the same commitment to preserving our local history as those who served thirty years ago? We may have an answer to that question soon. On Wednesday morning, I will join the developer, his attorney and engineer, township staff, a planning commissioner and a couple of supervisors for a meeting to discuss the CVS Pharmacy land development project. Here’s hoping that there’s a solution for the fate of the Covered Wagon Inn. Ford Motor Company featured the historic Covered Wagon Inn in 1956 publication! 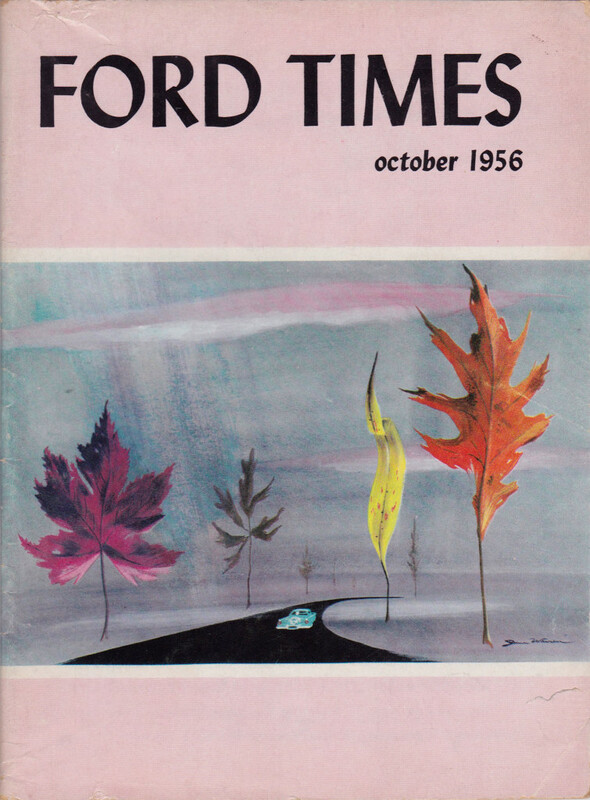 According to vintage Ford facts, the Ford Times was most known for the recipes. For many years recipes from famous restaurants across the country were published towards the back of the magazine. 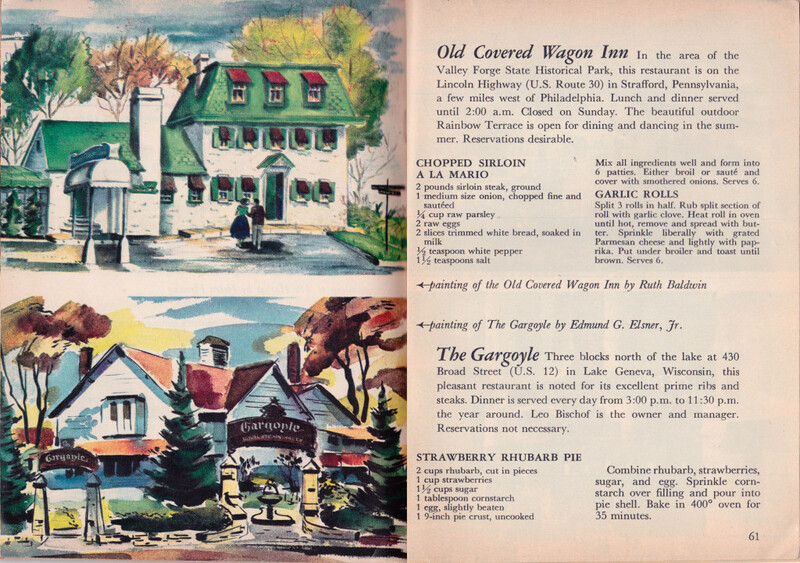 The Ford Times of October 1956 contained a painting of the Old Covered Wagon Inn by Ruth Baldwin and included favorite restaurant recipe chopped sirloin a la Mario and garlic bread. I wonder if the Sam (Severino) Caneda family was the owners of the Covered Wagon Inn when it was featured in Ford Times in 1956. A special thanks to my friend Greg Prichard, board member of Radnor Historical Society and Tredyffrin Easttown Historical Society, for scanning his copy of the Ford Times and providing these historic images. The passage of time … The following is a press release from the Sam (Severino) Caneda family, owners of the Covered Wagon Inn in the 1950’s, regarding the proposed land development plan which includes the demolition of the building. Folks driving through Strafford have probably passed the Old Covered Wagon Inn building – as we know it – and wondered what it was. We pass it and see it as home and as a living manifestation of the American Dream. When our parents opened the Covered Wagon in the 1950’s they had nothing but determination and a belief that their hard work would be rewarded. Their commitment to living their dream paid off. For decades the Old Covered Wagon Inn was the center of civic and social life in Wayne. The hottest big bands of the day, stars like Duke Ellington and Count Basie, stopped by to play there. Saturday days were for wedding receptions, nights were for dancing to Orr Marino and the Mainliners; weeknights were for Rotary & Lions Club meetings, Ward Marston on the piano, flambéed entrees & Caesar salad prepared table side in the colonial rooms. The Junior League held their Tinsel Ball there every year, St Raphaela Retreat house held an annual first flower of spring luncheon fashion show in the terrace, Villanova’s Blue Key society held fund raisers and Villanova boosters launched their campaign to reinstate football (they won!) at “the Wagon.” On any given day, at lunch or dinner, you would see the who’s who of Strafford, Wayne and Devon. Small business owners, whether it was Rod & Charlie Park from the hardware store, Bill Braxton, Joe Flagler (Flagler’s Citgo), Mr.& Mrs. Pugh, Mr. & Mrs. Rossi (Anro, Inc.), Russ Morgan (Main Line Printing), Mr. Eadah (Eadah’s Rugs & Ernest’s dad), The Taylors from Taylor Gifts, Sam Katz (Wayne Jewelers), Mr. Cappelli the Tailor, Mr. Fox & Mr. Roach BEFORE they became Fox & Roach, “the regulars,” all part of the history of that wonderful building. The days when such community institutions existed may have passed, but the value of a building that reminds us of what it means to be a community has certainly not. And you can see that meaning in the memories and stories people posted online in response to the news that a developer is looking to tear the building down. What’s more, there is real economic value in a building with the architectural surprises of the Old Covered Wagon Inn. Many of those treasures have been covered up over the years but all it takes is one visionary entrepreneur to figure out how to embrace the uniqueness of the building and its meaning as a community institution while giving it a 21st century twist. A CVS can be built – or rebuilt – anywhere. A drive thru may be convenient but it certainly does not make our community special. Once you tear down a historic building that meant so much to so many for so long, you do lose a piece of what makes a community special. We lose a piece of what makes Strafford, Strafford. And then what’s to distinguish us from every other town in Pennsylvania, or the United States, for that matter? Less than three weeks ago at the January 21, 2016 meeting of the Tredyffrin Township Planning Commission, Summit Realty Advisors (on behalf of their client CVS Pharmacy), proposed a land development plan for the corner of Old Eagle School Rd.and Lancaster Ave, in Strafford, Tredyffrin Township, Chester County. The redevelopment project includes a drug store with drive-thru which is apparently the ‘new and improved model’ for all CVS construction projects. In the plans currently proposed, it is that drive-thru appendage that requires the demolition of the old Covered Wagon Inn. After the Planning Commission meeting and my first Community Matters post on the proposed land development plan that would demolish the Covered Wagon Inn, no one could have been more surprised than me with the outpouring of support. A ‘Save the Covered Wagon Inn’ Facebook page now has over 1,500 ‘likes’, a Change.org petition opposing the demolition with 3,700+ signatures and comments, articles by reporter Adam Farence in the Daily Local and Main Line Suburban newspapers, support from Carla Zambelli on Chester County Ramblings, Caroline O’Halloran’s Savvy Mainline, bestselling historical novelists Loretta Chase & Isabella Bradford on their website, Two Nerdy History Girls, tweets on Twitter and Instagram, phone calls and emails from elected officials, historical societies, township and county staff, real estate developers and interested people from all over the country all wanting to share their personal memories of the Covered Wagon Inn and asking how they can help save it. Thank you all. Tredyffrin Township does not have a historic preservation ordinance preventing the demolition of the Covered Wagon Inn; making every historic property in the township currently ‘at-risk’! A legal fund, as some have suggested fighting the demolition of the Covered Wagon Inn, would serve no purpose. The real estate developer has a legal right to build the CVS Pharmacy with drive-thru at the Strafford location and unfortunately, also has a legal right to demolish the Covered Wagon Inn in the process. As someone who cares about this community, its history and the historic buildings that make it special, it has been rewarding to find so many people really do care about saving the Covered Wagon Inn. I remain hopeful that if ‘ there’s a will, there’s a way’ and that the plans for the new CVS in Strafford can be reconfigured so as to successfully coexist with the historic building. I am not opposing the redevelopment of this site, I am opposing the demolition of the Covered Wagon Inn. Sometimes doing the right thing is a challenge but I am confident that John Zaharchuk, owner of Summit Realty Advisors, is the person that can make it happen! Look for the next post (Update 2) which includes research on the early years of the Covered Wagon Inn by local historian and author, Margaret DePiano of Devon. Margaret has uncovered some new information about the Inn and the special 18th century owners linked to its past. Save the Covered Wagon Inn … Say No to Demolition of Main Line Landmark! In front of Tredyffrin Township Planning Commissioners on Thursday night was the Preliminary Land Development application for 625/629 East Lancaster Avenue in Wayne. Developer Summit Realty Advisors submitted a plan which demolishes the historic 18th century Covered Wagon Inn to construct a new CVS Pharmacy with drive-through and parking. I attended the Planning Committee meeting and wanted to update on the project. But first as means of full disclosure, when it comes to historic preservation, I am biased. For the last decade I have served as president of Tredyffrin Historic Preservation Trust, (www.tredyffrinhistory.org) whose mission is to “preserve and protect historic and cultural resources in Tredyffrin Township”, chair the Annual Historic House Tour and own one of the oldest houses in the Tredyffrin Township. On to the update: Presenting the redevelopment application on behalf of the developer was real estate attorney Alyson Zarro, real estate attorney with Exton firm Riley Riper Hollin Colegreco. (Interestingly, Zarro’s educational background includes a BA in History and a MA in Preservation Studies in addition to a JD). Summit’s preliminary redevelopment plan was presented to the Planning Commissioners by project engineer Joel Dellicarpini of Bohler Engineering. According to Google Maps, the proposed redevelopment site is approx. 1.73 acres (75,358 sq. ft.), a significant redevelopment parcel. (Click here to see the aerial view of the property and note the small building in lower right corner is the Covered Wagon Inn). The historic Covered Wagon Inn is not located in the center of the property but rather its location is at the edge, on the far corner. A tiny speck on the aerial map, the historic building is only 1200 sq. ft. in size (on the 75,358 sq. ft. parcel). Delicarpini showed the preliminary architectural drawings for the large CVS pharmacy and its drive-through. Unlike other CVS buildings, this structure would fit its surrounds and the engineer was proud to point out the short stone wall design feature as somehow that would make up for the destruction of the 250-yr. old Covered Wagon Inn. Following Delicarpini’s presentation, there was much discussion from the Planning Commissioners regarding the project. Much to my surprise, many of the comments centered on the demolition plans and wasn’t there a different way that would allow the historic building to remain. The engineer repeatedly stated that they had ‘tried’ in the design phase, but that leaving the Covered Wagon Inn would somehow impede on their ability to have a drive-through! Once public comments were permitted, I immediately launched into an impassioned plea to the Planning Commissioners to save the old Covered Wagon Inn. I gave the history of the township’s 2003 Historic Resource Survey which was to have been the basis for historic preservation ordinance. I was on the township’s HARB at that point and involved in the selection of the 350 historic resources that are part of the survey. The vast majority of the resources are personal residences with a handful of commercial buildings – including the Covered Wagon Inn! 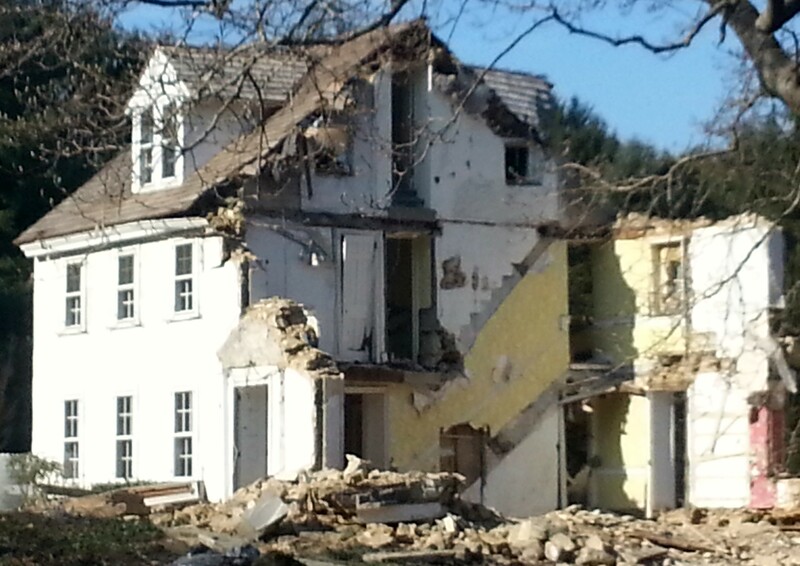 Farmhouse in January 2014. It was my personal hope that its demolition would have spurred local legislation to protect our historic properties. Sadly, in the intervening two years, nothing has changed and all historic properties continue to remain at risk. I explained that because Tredyffrin Township has no ordinances to protect its historic properties, there is nothing to prevent Summit Realty Advisors from demolishing the Covered Wagon Inn. Of the seven Planning Commissioners, it was remarkable to have so many of them understand and appreciate my passion for historic preservation and indicate support the saving of the Covered Wagon Inn. I want to personally thank four of the Planning Commissioners — Chair Tory Snyder, Vice Chair Bill Rountree, David Biddison and Scott Growney for their support! Snyder, a land use planner, Rountree, a civil engineer and Biddison and Growney , both real estate attorneys, all know that legally the developer ‘has the right’ to demolish the historic building yet each asked that they look for a way to save it. I know that the Planning Commissioners hands are tied – their decisions have to be based on the existing township zoning ordinances. Without a historic preservation ordinance on the books, their job is difficult! Township supervisor Murph Wysocki attended the Planning Commission meeting as the Board of Supervisor liaison. I have attended many, many Planning Commission meetings over the years and I have never known a sitting supervisor to take the microphone and offer his personal opinion on a land development project, until this meeting. Wysocki was clear that he was not speaking as a supervisor but rather as resident. As a retired real estate attorney, Wysocki completely understands the ‘rights of the developer’ in this case but he too appealed to Summit Realty Advisors to come up with a way to save the old Covered Wagon Inn. A former board member on Tredyffrin Historic Preservation Trust and a sponsor of the Annual Historic House Tour, Murph appreciates the importance of historic preservation in this community and I thank him for his support! The Covered Wagon Inn is a physical link to our past. Yes, we’ve all heard that before. But it’s not just about saving an old stone building, but about saving the layers and layers of information about our lives and those of our ancestors. Without that, we’d erase the stories of our past, as if the people came before us never existed. Historic buildings like the Covered Wagon Inn in Strafford play a special role in creating the distinctive character of our community. Historic places matter because they help tell the story of who we are and where we come from. As suburban sprawl and roadside development make more and more places look the same, it should be more important to preserve the history that makes this community special. The Covered Wagon Inn at the corner of Old Eagle School and Lancaster Avenue stands at the crossroads of Radnor Township, Delaware County and Tredyffrin Township, Chester County. Do we really want the ‘gateway’ to our historic 300 year-old township replaced with a drive-through CVS pharmacy? Where will it stop? So what is the next step … where do we go? There were a number of Summit Realty engineers, staff and legal counsel in attendance at the Planning Commission meeting. They heard the Planning Commissioners, a supervisor, myself as president of a historic preservation organization and several other community members appeal to the developer to come up with a plan that would save the Covered Wagon Inn. Time will tell to see if they got the message. Because there is no historic preservation ordinance opposing the demolition of the Covered Wagon Inn, it may take public input to persuade the developers. I will be sending the link to this post (and the last post with its many comments) to the president of Summit Realty Advisors, John Zaharck as well as the project engineers and legal counsel. In addition the links will go to the Tredyffrin Township Board of Supervisors, Township Manager Bill Martin, Planning Commissioners and PA State Rep Warren Kampf (R-157). A Facebook page, ‘Save Covered Wagon Inn’ was set up at: https://www.facebook.com/SaveCoveredWagonInn Created less than 24 hours ago and there are over 430 Likes. Please join the growing list of supporters. Continue to leave your comments here on Community Matters. Not everyone is on Facebook and because I am sending the link to this post to our elected officials and developer contacts, they will your comments here.